AD Architects undertook the detailed design of the refurbishment of an abandoned, former US Air Force school for use as a new SEN Free School. 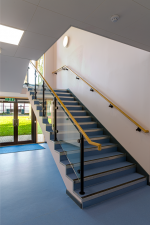 Phase 1 included the creation of a new entrance, therapy room, refurbishment of teaching accommodation, staff support spaces, school hall and external landscaping works. 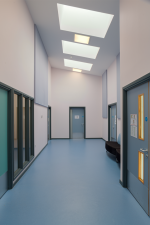 Phase 2 of the project included the strategic design of the site to allow for the phased refurbishment of the live school and its separation from the phase 3 construction area. 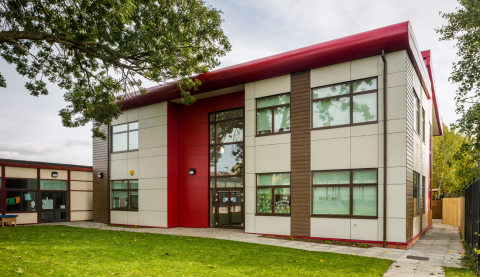 The developed design included the provision of a soft play area with play equipment, temporary car parking, refurbished and refitted kitchen to serve the entire school. 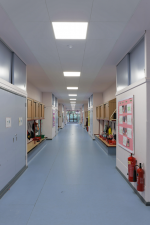 A further 10 classrooms including specialist food and design technology were refurbished with a new link corridor, as well as associated staff support and sanitary facilities. The incumbent nursery was refurbished and a new accessible entrance provided. Phase 3 was a new build project for an 8 classroom block, including specialist teaching spaces for Music, Science, Media and Food Technology, for Special Educational Needs pupils. This Free school project also includes a refurbishment of an existing Sports Hall, landscaping works and new car park layout.